A cinema made of Lego!!! 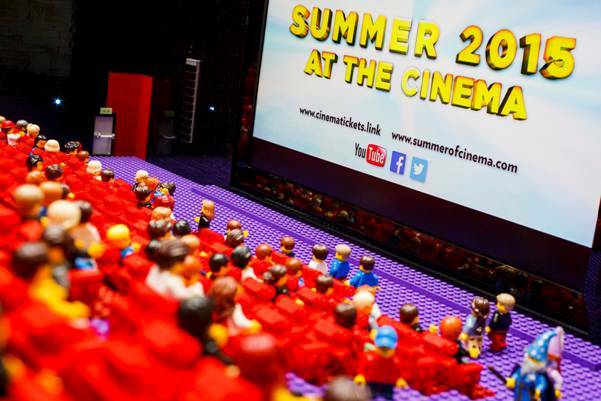 Film Distributors’ Association (FDA) has unveiled its eagerly anticipated LEGO® model, an incredible, custom-built diorama of a cinema made entirely from LEGO® bricks. Commissioned by FDA and constructed by Bright Bricks, the only builders certified in the UK by LEGO®, the model took 150 man hours to make and comprises 25,000 LEGO® bricks. The exhibition comprises seven sections: Family releases; Coming of Age stories; Action & Adventure; Comedy; Biographies & Documentaries; Thrills & Suspense; and a large section called Britain on Screencontaining images from both UK films and international movies that were made in the UK, a global filmmaking hub. Visitors will find one or two iconic classic images among the display too. The Movie Bit: A cinema made of Lego!! !